We love original product design. In a world of greyish slabs, new ideas stand out and are always welcome. Some of the products we remember, though, just took it too far. We don’t have a triangular tablet yet for a reason. What’s strange, though, is that those devices listed below are quite real, and were sold for a lot of money back in the day. Some of them even aspired to lead the way for others. It never worked that way, and if you’ve ever looked about examples of what one should NOT do in product design, take a look at the gadgets below. Woohoo, the ToshibaG450, where should we start here? Let’s try with a logical question: Is this really a phone? Turns out, it is! We’d call it the torture phone, with simply impossible controls on an even more stupidly small 96x39-pixel screen. Hey, it would have made the perfect gift for someone you hate in 2008. Siemens Xelibri is a whole series of phones dedicated to the unsightly, pseudo-original design. Coming in all different sorts of weird, we’ll let the pictures speak for themselves. The Nokia 7280 takes impractical to the extreme, but if you want plain ugly, it just has to be a Vertu. The kitsch super expensive Vertu Signature Cobra comes with diamonds, emeralds and a hideous cobra. When we first saw the picture of this little monster, we thought it was a Photoshop experiment gone wrong. Alas, it’s real, it’s tiny, it’s a flip phone and it has an antenna. Different should describe it best, right? The first Symbian Series 60 phone to arrive in North America and the first with integrated camera in America, the Nokia 3650 was also the first with this plain weird circular keypad. It does remind you a rotary phone, but typing text messages on that keypad is almost as easy as on a rotary phone too. “Designed just for kids, but appeals to parents”... not! The Firefly is simply a god-awful phone with kid-friendly features like limited functionality and no real keypad. Nokia’s second 3G handset, the 7600, was a tear-shaped abomination of a phone. It was clearly aimed at the “fashion” market, which luckily now seems to have disappeared from manufacturers’ fantasies. Honestly, it is such an obviously ridiculous realization of the idea of a smartwatch, it just had to be here. We’ll let the picture again do all the talking. 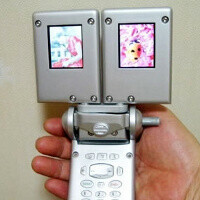 If one screen of ugly was not enough, an anonymous South Korean manufacturer showed this at an expo back in the day. It gets the honorable last but not least place in our ranking, so you can finally rest your eyes from all this ugliness. It was worthit, wasn’t it? xoom isnt half as ugly as these phones! I had the 3650! It was such an awesome phone, with lots of cool features and apps back then!! How I used to love it! PA, dont dare say its ugly! Wee-ooo0 Wee-ooo0 Wee-ooo0 Uh oh, fun police are on the scene... everyone turn down the jokes. Nokia could release these weird designed phones because they dominated the market then and people went crazy over these as I was lol. that was then but now things are different. At least there was variety and creativity back in the day.. I think the Samsung one looks quite a good phone for girls. My girlfriend had the Nokia 3650! She still keeps it. And she loved the phone. For the tecnology of that time, the Camera was realy good! She still has pictures taken with it in her flickr account. but why a circular keypad???????? in my opinion, the original had the best design, and the 3g/3gs was the worst, you really had to love the aluminium back of the original iphone. Fair play to the manufacturers for releasing these phones. Some of them might not have looked that great but at least they had the guts to release something completely different. Honestly, All Nokia's phone that you have listed were AWESOME.